Portuguese coffee firm Delta Cafes has entered the snack bar business with the launch of a energy-boosting cereal bar that contains caffeine. 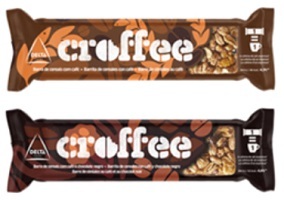 Branded as Croffee, the cereal bar is said to be “healthy, satiating and stimulating” and comes in a brown-coloured wrapper bearing images of coffee beans. Each bar is said to contain caffeine content equivalent to one espresso coffee, and is claimed to be source of fibre and to contain only 3.8g of sugar. Croffee cereal bars are available in Cereal with Coffee and Cereal with Coffee and Dark Chocolate varieties as both single bars and boxes of five bars, with an RRP of €1 ($1.13) and €2.99 ($3.39) respectively. Delta Cafes said Croffee would initially be launched in Europe, Angola and Brazil before being rolled out worldwide.